By the 1960s, Peregrine Falcons were gone from the East and large portions of the western United States due to the effects of DDT, which was banned in 1972. The Peregrine Fund pioneered many techniques for successfully producing the birds in captivity and releasing them to the wild. DDT also caused the Bald Eagle to become nearly extinct. The Peregrine Fund was the first to release the eagles by hacking and to establish a breeding pair. The Peregrine Falcon and Bald Eagle have been removed from the U.S. Endangered Species List. The Maya Project studied birds of prey in Guatemala, Belize and Mexico, where a vast landscape of intact forest and wetlands made the region a global conservation priority. This project studied the biology of poorly known tropical forest birds of prey, documented fragile food webs, and analyzed conservation issues and solutions. The Neotropical Environmental Education Program helped change human attitudes toward raptors like the Harpy Eagle by building national pride, educating teachers and producing educational materials in Panama. Only two breeding pairs of Mauritius Kestrels remained when The Peregrine Fund began supporting a recovery program. Through captive breeding, releases to the wild, nest boxes and other techniques developed by The Peregrine Fund, the kestrel recovered. In Zimbabwe, The Peregrine Fund partnered with the Zimbabwe Falconers’ Club to investigate the rare Teita Falcon, as well as the effects of DDT on the Peregrine Falcon and other raptors, ecology of little known species, effects of habitat change on raptors, captive breeding of Teita Falcons, and educational programs for students. Support for students has bolstered local capacity for conservation and research by gathering baseline data in Mongolia on Cinerous Vultures and developing methods to trap, band and radio-tag little-known New Guinea Harpy Eagles. As the effects of climate change on bird populations became evident, The Peregrine Fund conducted research and monitoring in Greenland to gather information about the timing of migration and breeding, breeding performance, and population size and distribution. 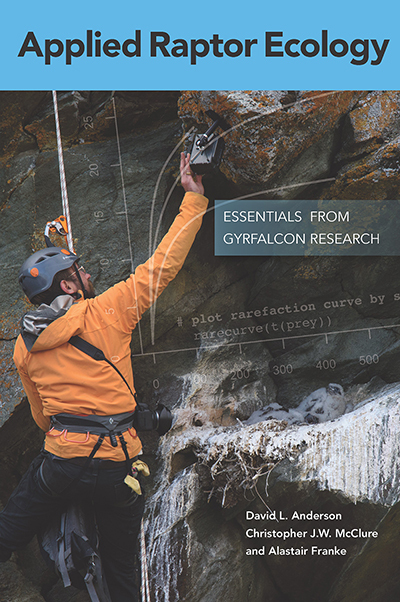 Applied Raptor Ecology provides raptor researchers with the blueprint to determine which questions should be asked, record consistent data usable by researchers worldwide, apply appropriate analysis of those data, and break down the obstacles to collaboration. The Peregrine Fund is a 501(c)(3) non-profit organization.